The puppies names are …(fill in the blank). Our ‘dog days’ of summer is the time we get to welcome some cute and cuddly puppies to the world. We love (especially Ellen & Isaac) our ‘puppy days’ of summer. We have a few litters ‘on the ground’ (born) this summer that will contribute to the future and success of the racing kennel in about 3 years. 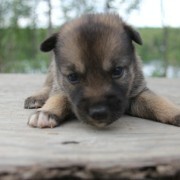 This post is about a litter of 5 puppies that are approaching 3 weeks old and they are in need of some names. Our Ellen (8 years old) and Isaac (5 years old) are normally the masters at establishing names but we thought it may be fun to see if anyone outside of the kennel could come up with some creative names. It’s nice to have a theme to the litter names (Generals, States, Rivers, Mountains, Etc.). 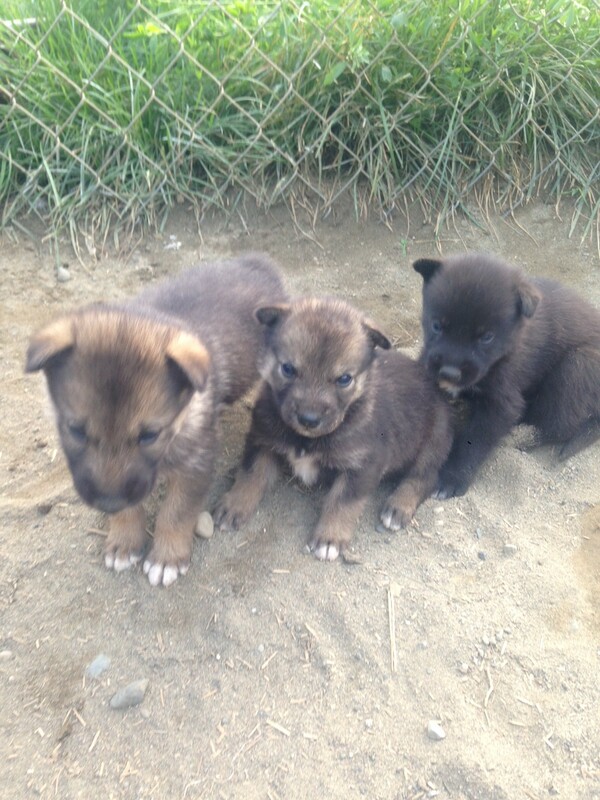 Then the themed name litter mates stand out to others in the kennel. This litter of 5 includes 3 males and 2 females. 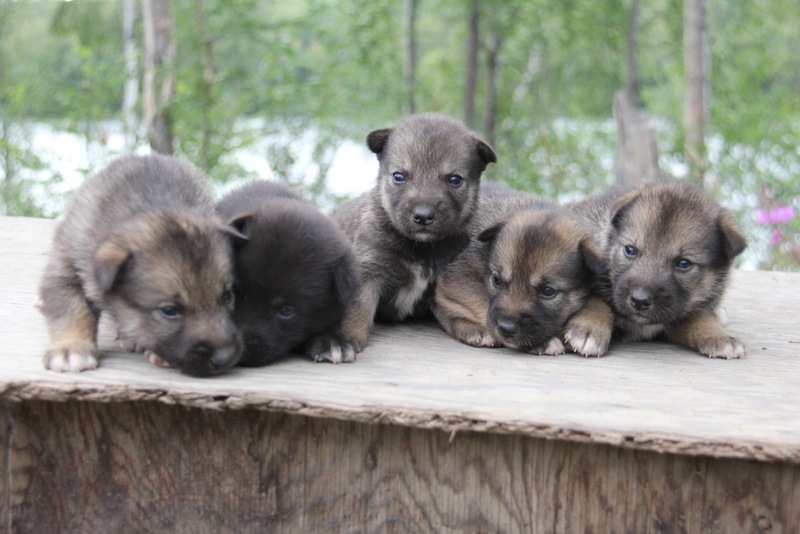 Four of them are brown in color (2 females and 2 males) and one male is black. They are a lot of fun and growing fast. They mom is Viper and their Dad is Shred. If you have some good names for these wonderful puppies post a comment to this blog with your idea…We will let you know what we decide to name the pups … hopefully it’s your idea. Thanks. 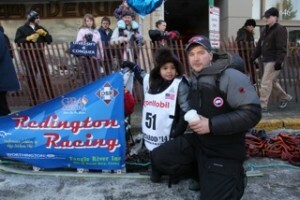 http://teamredington.com/wp-content/uploads/2014/08/IMG_2495.jpeg 854 1280 musher http://teamredington.com/wp-content/uploads/2014/02/TeamRedingtonLogo.jpg musher2014-08-02 22:04:292014-08-02 22:11:15 The puppies names are ...(fill in the blank). I love raising and running dogs. It has always been part of my life. When I was a small kid, I remember riding in the sled while my Dad would take his dog team to check his trap line. My Grandpa, Joe is known as the Father of the Iditarod. I am the 3rd generation of Redington’s to race the Iditarod. My Grandpa competed in the race he started 19 times and the last year he finished he was 80 years old. My family has had a long history in participating in this race. 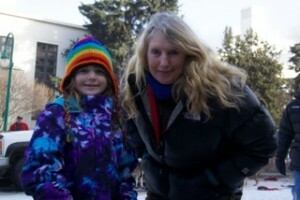 I hope that there will be many more Iditarods in the future for my family and me. This winter we did not have much snow in many parts of Alaska which made training a little tough. We traveled to areas with better snow including to Cantwell and Eureka Lodge. I raced in the Knik 200 and the Denali Doubles. 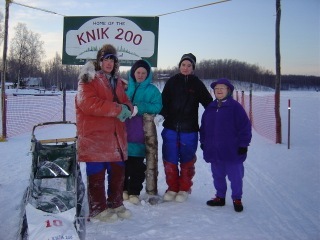 Other mushers from my kennel participated in the Knik 200/100, Denal Doubles, Copper Basin 300, and the Junior Iditarod. Everyone including the dogs had a lot of fun this season in training and during the races. Getting ready for Iditarod is the primary focus in training and racing. In preparation for the Iditarod all mushers are required to send out a ‘food drop’. The food and supplies are then distributed to the villages we travel through during the race. 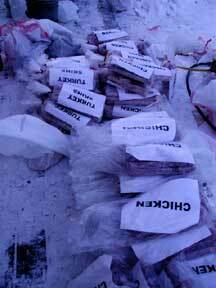 This year I shipped out over 2600 pounds for the Iditarod food drop. The contents of my food drop included dog food, dog gear (booties), people food, and my gear (gloves/socks/extra clothes). The dogs eat everything from dog food, salmon, supplements, and a variety of different meat. The * after the dog’s name indicates the 10 dogs that finished with me in Nome. The other dogs were dropped at checkpoints along the way (mainly due to being tired or having a sore muscle). The dropped dogs were flown backto my kennel to rest and recover. The trail was tough and very challenging this year. I am proud of the dogs in my team and the fantastic job they did. My dog sled held up very well through the rough sections of trail. It is always a nice feeling making it to Nome and to see my family. This year, I finished in 8th place taking a little over 9 days and 4 hours. This marks my 4th consecutive year being in the top 10 and also the fastest time I have ever finished in. A big thanks to all the kids that took the time to follow me in the race and write me letters. We booty up here at Redington Kennels … or perhaps the correct term is booting up and not meaning a computer restart. Joking aside, booties are a critical part of sled dog care. We take our dog care very seriously. Why are booties needed? Dogs have tough pads on their feet and they sweat out of their pads. Even with those tough pads they may be vulnerable to damage on icy trails. 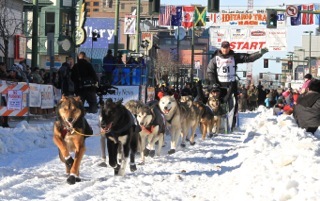 The average sled dog by the time the season is over may have run over 3,000 miles. Dog booties provide a layer of protection to the dog’s pads (like shoes provide protection for people). Booties are disposable and are normally made from Codura material with Velcro attachments. 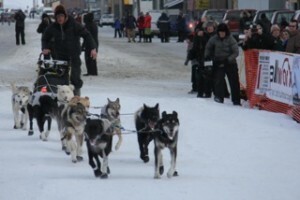 A musher may go through 1,500-2,000 booties during the Iditarod and more than that during training. 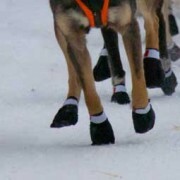 The average Iditarod or Quest kennel could very well go through 3,000-5,000 booties in one season. We recycle booties during training which means washing, air drying and then sorting the booties that are still in excellent condition for reuse. Some of the worn-out ones will be sent to school kids who write to Ray. As noted, booties are the first layer of added protection to the dogs’ tough pads. However, even with booties sometimes a dog’s pad will still get sore or split. If you think about humans, sometimes we will get blisters or soreness on our feet, too. Dogs tend to not get blisters. 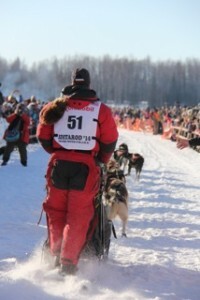 Mushers take good care of their dogs’ feet and can often be seen rubbing special ointment on the dog pads after runs and at checkpoints during a race. This helps the canine athletes maintain healthy feet. Booting dogs is second nature for Ray and most of his mushing peers. Ray has put on and taken off thousands and thousands of booties over the years. Ray is incredible efficient with correctly putting on dog booties; this is a talent that rookie mushers have to learn from experience. What does it cost for booting up? Keeping our high-performing canine athletes healthy and raring to go is priceless. On average, a single booty costs between one and two dollars each (normally there is a volume discount). Every time a ten-dog team is run (with each dog using four booties), it will cost around $40 per run for the booties alone. 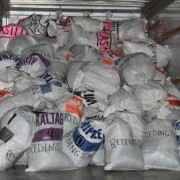 I was in Anchorage last week making one of many trips to pick up yet more booties for Redington Kennels. The supplier thanked us for all the great business and said we were one of the top two kennels this year for the amount of booties we have bought. We are at an all–time peak for bootie consumption due to the multiple teams running out of our kennel this year. 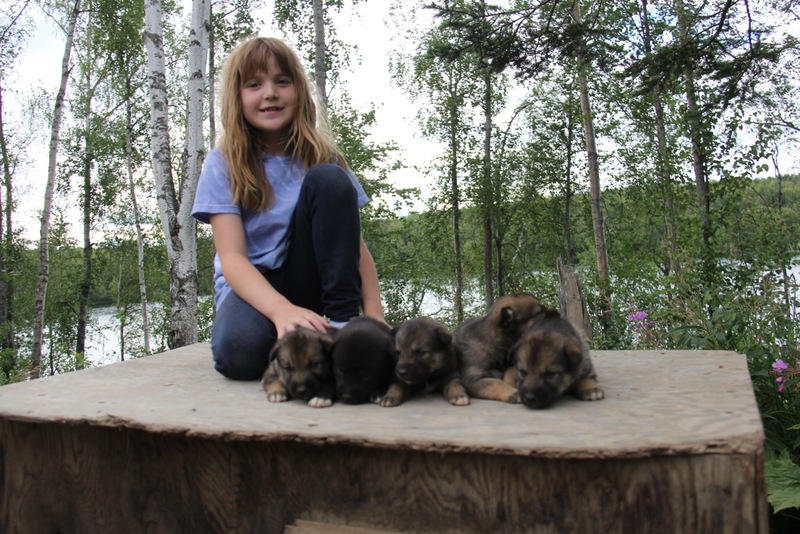 This is a cost we plan for in the operation of our sled dog kennel. That said, special mention goes to Bill and Carole Stead who have bought Ray’s dogs’ booties during Iditarod for all but Ray’s first Iditarod. Huge thanks to them and to all our sponsors for helping Team Redington Booty Up!